Some people don't mind the company of a murderous maniac in a black cloak and creepy ghost mask. Those kind of people will have no problem hanging around this Ghost Face decoration. This one however, is a lot safer than the real thing, because it's a decoration and probably won't go a hideous killing spree in your town, though we can't be entirely sure on that. Imagine being buried for hundreds of years inside of a dark, smelly casket. That's exactly what happened to Mr. Bones here. 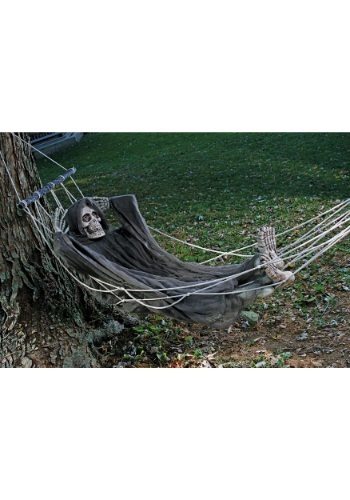 Since he's broken out of the casket, all Mr. Bones does is stretch out his limbs.This 60" Lazy Bones outdoor decoration gives him the perfect opportunity to do so and now he's the happiest dead guy you will ever see! This reaper's done reaping for the day, and just wants to play. Won't you help him swing?? 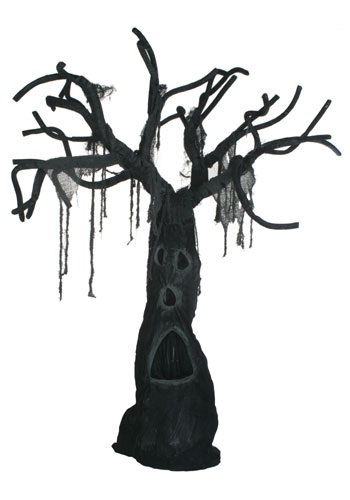 (We won't blame you if you decide to pass...) Add this decor piece to your yard for some frightful fun! He's sure to put a scare in the neighborhood children, and put you in the scary yard hall of fame! Did you know that barbed wire was first patented in 1867? It was originally used for keeping cattle in. You're sure to frighten a few escapees with this Barbed Wire Garland. It's time to roll out the red carpet for your visiting guest. Oh... wait. That's not quite the same red I was talking about. Well... look... something came up and I won't be able to make it this year. Sorry. 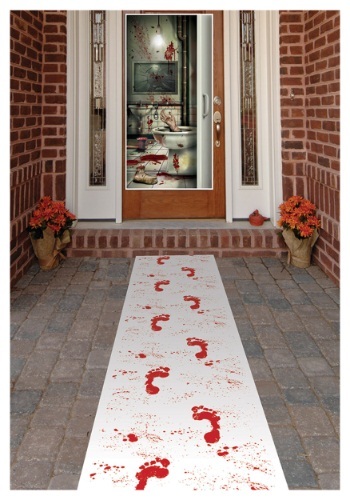 Frighten everyone headed towards your door with this Bloody Footprints Runner. Her reputation is ruined! This little witch was coming in for a landing and experienced some 'technical difficulties' in finding her target. Get in the Halloween spirit when you add this decoration to your front yard! This creepy guy has left the castle and he's come to terrorize your village. We'd recommend putting him in your front yard, but he's so terrifying he might just scare off your little guests... and you do want to to have trick or treaters this year, right? Let's just stick him inside and save him for the grown ups party. Are you sad because spirits of unrest don't flock to your home? 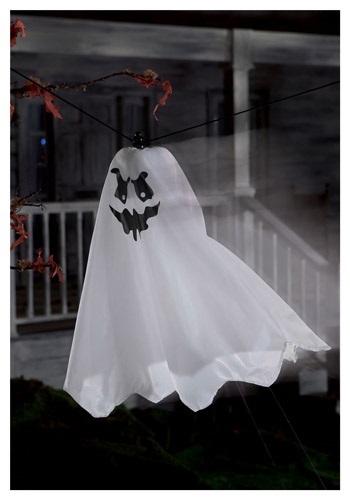 All it takes is one to get the whole ghostly crew to come around, and this Flying Ghost decoration was specifically designed to attract ghosts. It has a realistic moving action and shrieks like the dickens. Once you place it in your yard, you can expect an increase of ghostly activity in your home by somewhere between 0 to 10 times more than normal. She didn't want to die an old maid, so this Groundbreaker Bride is coming back to take care of unfinished business! Get her Groundbreaker Groom so you can host a ghoulish wedding.Don't let this bride get wet--bring her indoors if it rains. She uses 3 button-type LR44 batteries, which are included; however we recommend purchasing extras to make sure she stays lighted for your entire celebration. Something is watching you, look at what is picking though the bushes! It's a pair of evil eyes! You will totally scare all the trick or treaters who walk up to your house when you purchase this Haunted Hedge Creature. It's lights up,makes growling noises, and vibrates when someone walks past! This is a cool and unique outdoor decoration. Nothing screams Halloween like an evil creepy witch sitting on your porch and cackling at you. She'll terrify those pesky trick or treaters or delight them. 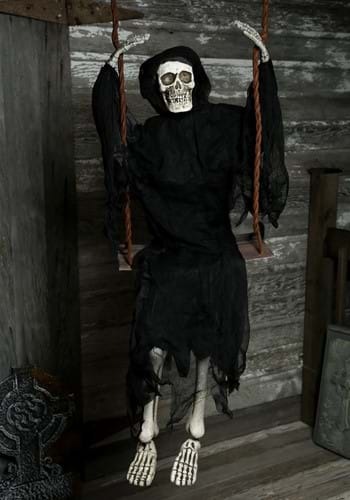 Hang a Kicking Witch on Swing on your front porch for a haunting look! Happy Halloween kiddies!!! 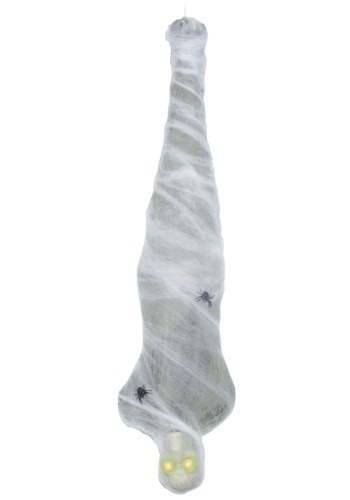 When you hang up this Cocoon Man decoration all of your guests are sure to be curious about it. Like, is there a giant spider hiding somewhere in your house? Or are you secretly a massive arachnid in a human costume? (If so, great work. It must be a really good costume!) 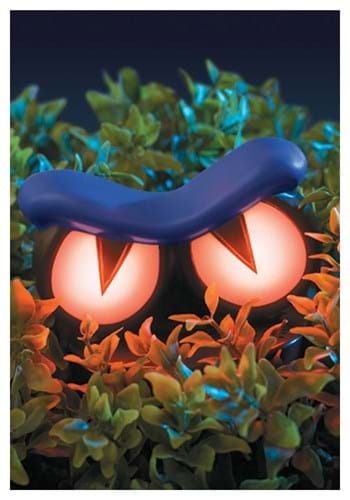 Add this Light Up Cocoon Man decoration to your spooky Halloween scene and let your guests keep guessing! 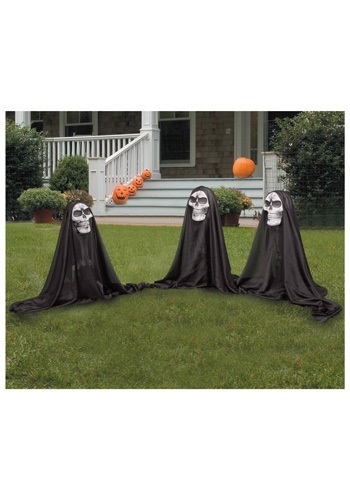 Make your lawn even more ghoulish when you add these reaper lawn decorations! Make your lawn spooky to the max with this grim reaper 3 figure set. It's a scary and fun outdoor Halloween decoration! Stage your front yard as the scene of fresh, unmarked graves with the help of this standing grave digger decoration. He looks like he belongs in a grave himself, making his presence even more terrifying. Want to give the trick or treaters the giggles? Why not add a dimwit witch to your yard decor. 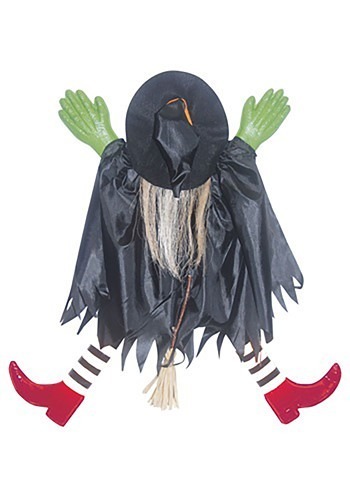 This clever decoration features a witch who may need to go back to broom flying school for a few more lessons. This witch can attached to any tree you may have in your yard and will be sure to put a smile on all the neighbors faces! Don't let the size of this phantom fool you...he's very spooky despite his miniature size. He can see you from yards away and when he does, his ghostly eyes light up red. Just choose the perfect spot for your Unknown Phantom, place the included stake in the ground, then put the phantom right on top. This decoration looks great in a graveyard scene. Double, double, toil and trouble...or maybe that should be triple, triple! Let this trio of witches greet your Halloween party guests or trick-or-treaters! Each witch has molded plastic face, hands & feet with long synthetic hair and a bamboo broom. Whether you imagine them as Shakespeare's Three Weird Sisters from Macbeth or residents of early Salem, Massachusetts, this Witchly Group is a great addition to your Halloween decor! You've seen pink flamingo lawn ornaments before, right? They're sort of a classic piece of Americana. They've become more rare than they used to be, in fact, they were thrown away en masse in the 1990s. Problem is, they're back and they're hungry. We thought we were through with the pesky things, but little did we know that they weren't through with us. 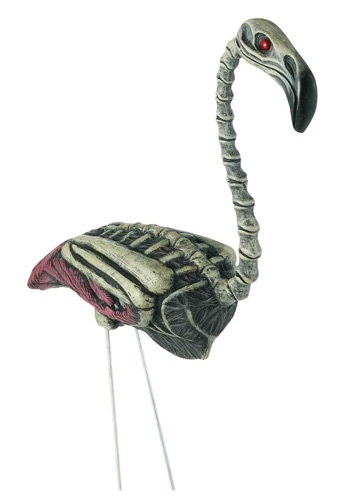 We always thought the zombie apocalypse would rise quickly, but we never thought it would start with zombie flamingos. Why, Florida, why? It looks like one of the gnomes ate some infected shrubs and then that gnome started to eat another gnome! It's a zombie gnome outbreak! 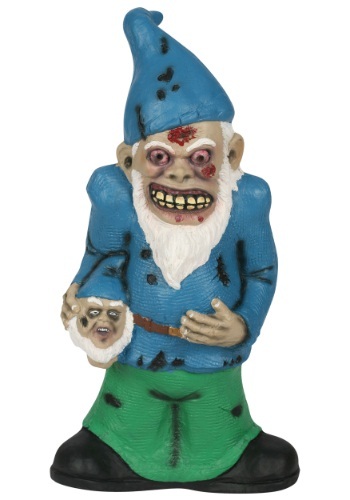 Add this Zombie Yard Gnome: Style A to your garden and he'll make sure that no bunnies or squirrels ruin your plants. Did I mention he will also eat those bunnies and squirrels? Anything with a brain will do!